E-solutions e-solutions is an electronics store based out of Goa. It is headquartered in Verna, Goa. e-solutions was established in 2009. It currently operates TWO stores across the states of Goa and has wide range of electronic products to choose. 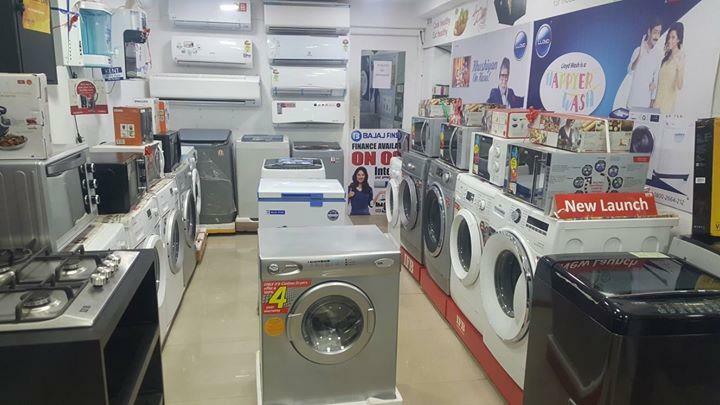 Our showrooms offer various products, including Televisions, Projection Televisions, Commercial Air Conditioners, Audio System, Hi-Fi Separates, Video Cameras, Water Purifiers, Washing Machines, Washer/Dryers, Refrigerators, Air Conditioners, Vacuum Cleaners, Microwave Ovens, Cooking Range, Gas Tables, Chimneys, Dish Washers, Home Appliances, Mixers, Projectors, Laptop and Mobile Phones. We are the major authorized Dealers and distributor of some of the World’s most recognizable brands including Samsung, Sony, LG, Bosch, IFB, VU, Lloyd, Blue star, Carrier, Voltas, Toshiba, Hitachi, Daikin Whirlpool, Electrolux, Philips, etc. What makes us different from others are 100% product knowledge and prompt customer service. Customer Care We believe that customer care is a keystone of our success. Our technical support is free both via telephone and email for professional users and our support staff are all experienced to resolve the queries. 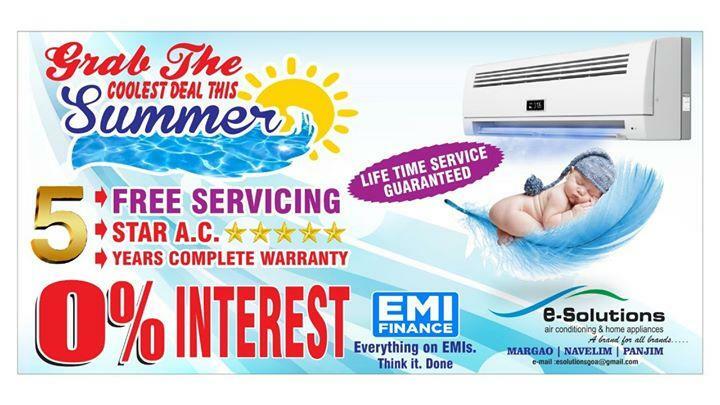 Finance We provide 0% Interest EMI options to our customers to avail all products. Mission To improve the quality of life for our people, customers and society. Vision "To be a leading retailer of consumer electronics in the market"
e-solutions is an electronics store based out of Goa. It is headquartered in Verna, Goa. e-solutions was established in 2009. It currently operates TWO stores across the states of Goa and has wide range of electronic products to choose. 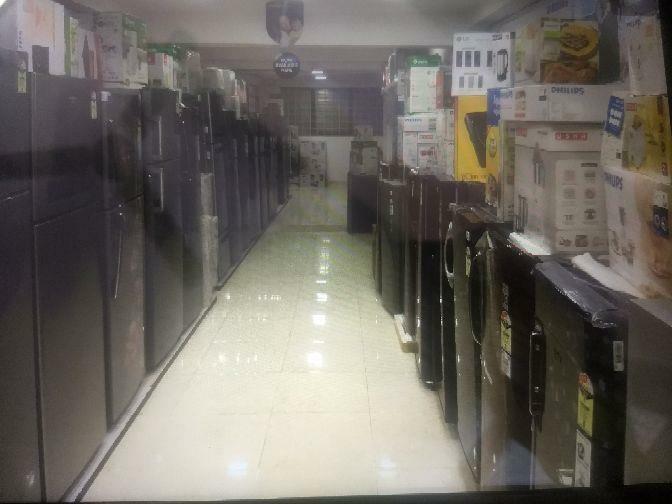 Our showrooms offer various products, including Televisions, Projection Televisions, Commercial Air Conditioners, Audio System, Hi-Fi Separates, Video Cameras, Water Purifiers, Washing Machines, Washer/Dryers, Refrigerators, Air Conditioners, Vacuum Cleaners, Microwave Ovens, Cooking Range, Gas Tables, Chimneys, Dish Washers, Home Appliances, Mixers, Projectors, Laptop and Mobile Phones. We are the major authorized Dealers and distributor of some of the World’s most recognizable brands including Samsung, Sony, LG, Bosch, IFB, VU, Lloyd, Blue star, Carrier, Voltas, Toshiba, Hitachi, Daikin Whirlpool, Electrolux, Philips, etc. What makes us different from others are 100% product knowledge and prompt customer service. Customer Care We believe that customer care is a keystone of our success. Our technical support is free both via telephone and email for professional users and our support staff are all experienced to resolve the queries. Finance We provide 0% Interest EMI options to our customers to avail all products. Mission To improve the quality of life for our people, customers and society. Vision "To be a leading retailer of consumer electronics in the market"